One of the benefits of setting up your Square account as a business instead of an individual is that you are can configure rewards for your customers that can be used on your Square Register powered POS system on your iPad. This can be a great way to retain customers and build loyalty because you can reward your best customers for frequently shopping at your location. The rewards will appear as an itemized part of the payment flow, and can be setup to work with either cash or credit purchases or both. The only downside is that the feature only works on the iPad version of Square Register, but that applies to most consumers so it is still a valuable feature. Click "Customize" within the Punch Cards section of your Rewards page. Enter the amount your customers must spend to earn a punch as well as the number of punches each punch card will have. 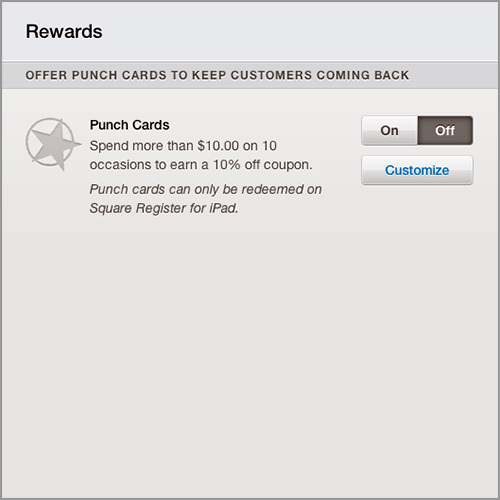 Select the reward your customers can redeem for filling up their punch cards. You can select a coupon for either a dollar off amount or percentage off amount. The earned “punches” for both cash and credit purchases will show up on the receipt screen and the customer’s copy. Once they have earned enough “punches”, their reward coupon will automatically be attached to the bottom of their receipt so they can redeem it on their next visit. *Note: In order to earn punches, customers must use the same phone number or email address every time they make a purchase. Rewards are associated with a particular number or address, so each one will have its own unique “punch card”. To disable your “Punch Card” program, simply toggle the switch to "Off" next to the reward program on the online dashboard. You'll then be prompted to confirm that you want to disable this program. If you make changes to your reward program, Square will completely delete you program history and your customers will essentially be starting from scratch. As always, you'll be prompted to confirm the changes before they are mad final as a safety precaution. Tap on the Redeem Rewards icon from your Item Library, which will pull up the Rewards finder. Enter a phone number, email address, customer name, or redemption code. The finder will display available rewards. Tap the circle next to the reward to select it.